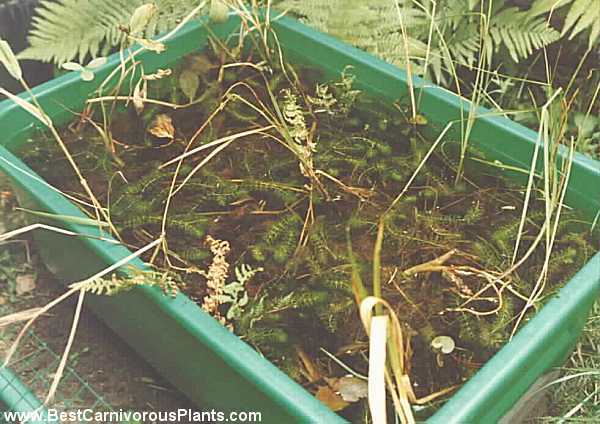 Carnivorous Plant Newsletter 26: 73-82. Keywords: chemistry: habitat - cultivation: Aldrovanda - ecology: Aldrovanda. Rear cover: This dystrophic Aldrovanda lake is bordered by undisturbed littoral vegetation. Poland, June 1993. Phot by C. Breckpot. This plant was first cited as Lenticula palustris Indica ín 1696 by Plukenet. In 1747 Monti described and named it Aldrovandia in honor of the Italian naturalist Ulisse Aldrovandi (1522-1605). Finally in 1753 Linnaeus took over Monti's description and in his Species Plantarum used the name Aldrovanda vesiculosa, which has been noted as being an orthographic error (Duval-Jouve, 1861), although the original spelling is to be retained. Since the last part of the 19th century Aldrovanda has been studied extensively. It is commonly known as the Waterwheel Plant. The genus Aldrovanda is monotypic nowadays, but it probably contained more species in the past (Huber, 1961; Degreef, 1997). The Waterwheel Plant belongs to the family Droseraceae. As an aquatic, it is clearly separated from the rest of the family. The rootless plant floats just below the water surface (Figure 1). The measurements of different parts of the plant body are rather variable. The length of adult plants ranges between (1.5)6-11(20) cm with a shoot diameter 1 to 2 cm (Aston, 1983). The serrulate stems are 0.6-0.7 mm wide and basically simple (Caspary, 1859). In plants growing under favourable conditions, the main shoots usually branch after every 3-4 cm (5-7 whorls) giving rise to short lateral branches in the axils of whorls. In time these branches may form offshoots. In temperate regions where Aldrovanda rarely flowers (bearing only abortive or no seeds), this is the only way of reproduction. In average 12 to 19 whorls are arranged along the stem (Kamiński, 1987a) like spokes in a wheel and each whorl consists of (5)7-8(9) leaves 7-11 mm long (Caspary, 1859). The distance between grown-up whorls ranges between 0.5 to 0.7 cm (Kamiński, 1987a). When in growth new whorls are formed at the plant's apex, while the oldest whorls and internodes at the rear die (Ashida, 1934). The rate of stem elongation of plants in Japan has been found to be 0.4-0.9 cm/day (Komiya, 1966). This fast growth is unrivaled among terrestrial carnivores, none of which produces a new rosette or even a new leaf every day! The leaf consists of a dorsally flattened petiole, 5-6(9) mm long (Caspary, 1859), connate at the base, broadened upwards and ending in a trap and (1)4-6 pointed bristles, each 6-8 mm long (Diels, 1906), arranged laterally and dorsally to the trap. The bristles protect the traps from being unintentionally closed by floating debris. The petiole is important for the plant's photosynthesis and contains air chambers which contribute to helping the plant float. The Waterwheel Plant has the same trap mechanism as Dionaea muscipula, but the traps are smaller and function under water (Iijima, 1981). Darwin named it "the miniature aquatic Dionaea" (Darwin, 1896). The trap closes with amazing rate within 0.01-0.02 seconds (Ashida, 1934, 1935). This is one of the most rapid movements found in plants. The details of how the trap closes are still rather obscure. Figure 1: Aldrovanda vesiculosa. Photo by R. Kaminski. The traps have a leaf blade consisting of two semicircular lobes, convex outwards, each 4-5 mm wide and 5-7 mm long and connected along the midrib. The trap stalk is twisted 90° to the left. This way, one lobe is turned to the bristles and is called the bristle-side lobe. The other lobe looks away from the bristles and is called the free-side lobe (Ashida, 1934). In addition to this torsion, the trap is bent backwards through an angle of 30-40°. These torsions are of an evolutionary importance because the chance of catching prey is enhanced when the mouths of the traps face outwards from the stem (Lloyd, 1942). When the trap closes, the free-side lobe bends to a greater extent than the opposite lobe. This explains the asymmetrical shape of the closed trap (Ashida, 1934). Each lobe consists of two regions, a thin two layered marginal and thicker three layered central one. Note how delicate the lobes are! The border line between the two regions is called the enclosure boundary (Ashida, 1934). The margin of each lobe is bent inwards and carries 60-80 small teeth (Fenner, 1904). Trigger hairs are found in the central zone. They are 0.5-1.5 mm long, 0.05 mm wide (Lloyd, 1942), 30-40 in number, of which 18-20 are near the midrib and 7-9 are near the enclosure boundary (Haberlandt, 1906). In temperate regions the plants survive winter by means of elliptic turions (with acute poles) about 4-6 mm long. Under ideal conditions these sink to the bottom of the lake and start floating again as they start to grow next spring. In tropical regions the plant grows throughout the year without forming turions. The plants flower and set seed towards the end of summer only in warmer climates where water temperature are higher than 25°C (77°F). The small solitary 8 mm flower (Lloyd, 1942) arises above the water surface, carried by a short 5-15 mm (Aston, 1983) robust peduncle emerging from a whorl axil (see front cover). The capsule becomes pendulous after flowering. The flower has a strict pentamerous structure with five sepals, white or tinged pink petals, stamina and styles. The ovary is unilocular, superior, subglobulose, with 4 or (usually) 5 placentas bearing 8-13 ovula. The placentation is parietal. The capsule is globulose, membranous, 4 mm long, 3 mm wide, and up to 1.5 times the length of the sepals (Aston, 1983). Seeds number mostly 6-8 per capsule or rarely fewer (Diels 1906), are broadly ellipsoidal with a short thick basal foot, are operculate, black, shiny and measure 1.5 x 1 mm (Diels, 1906). The pollen grains are 45-63 microm large, and are united in tetrads. Each grain has three pores with an operculum (Takahashi & Sohma, 1982). Aldrovanda vesiculosa is distributed widely. It grows in Africa, Asia, Australia and Europe but is absent from North and South America (Caspary, 1859; Berta, 1961; Jäger, 1964) and Antarctica. The species has its most northern distribution in Europe. With its sophisticated mobile traps, one might think that Aldrovanda would be at the top of the evolutionary ladder and therefore of recent origin. But this is not so. The morphology of the flower and the age of fossil seeds and pollen (Huber, 1961; Degreef, 1997) are indications of the archaic character of the plant. The oldest traces of the Waterwheel Plant in Europe are seeds and pollen from the Upper Cretaceous (85-75 MYA) and Eocene (55-38 MYA), respectively (Knobloch & Mai, 1991; Huber, 1961). The warm Tertiary climate was favourable for a wide distribution of the plant. Later, during the glaciations of the Quaternary; Aldrovanda was regularly driven back to southern Europe (Berta, 1961). More about the fossil record of Aldrovanda in another article in this volume (Degreef, 1997). The question of the origin of modern Waterwheel Plants in Europe is still unsolved. Two theories have been formulated. According to some authors the plant is a relict of the Tertiary flora (e.g. Berta, 1961). They assume that the plant never disappeared completely from the continent. This theory is supported by numerous fossil records, the fragmented distribution of today and the fact that Aldrovanda forms turions which might be an evolutive adaptation for plants in temperate regions. Jäger (1964) states that the modern plants were introduced by migratory birds coming from the tropics (see below). This theory is partly supported by the plant's absence in North and South America and the fact that there is no longer a species diversification. We do not know which theory is correct. A study of growth behaviour of African plants grown in temperate Europe (i.e. do they form turions?) and investigation of the genetical differences between European and African plants would help to solve the mystery (Studnička, 1984). Unfortunately, there are no records of recent observations in Africa. Today, Aldrovanda is dispersed irregularly and sparsely over a large part of central and eastern Europe (Berta, 1961; Jäger, 1964). 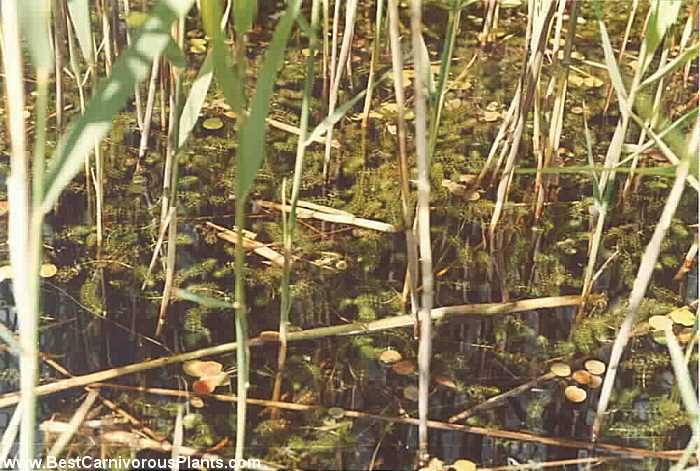 Figure 2: In this characteristic habitat Aldrovanda is accompanied by Stratiotes aloides and Hydrocharis morsus-ranae. Europe, 1993. Photo by C. Breckpot. Looking at a distribution map indicating all 19th and 20th century sites (Berta, 1961), we see that the northernmost distribution in western Europe was situated in southern France whereas in eastern Europe it was much more to the north, in the neighbourhood of St. Petersburg in Russia (60.5 parallel). Apparently the winter temperatures are not so determinative for its distribution. This a bit strange for a plant which is known as loving a warm climate. And why is the species absent from northwest Europe with its milder winters? The point is that it is not the winter but the summer which determines where Aldrovanda grows. If the water temperature during the growing season is sufficiently high, then the plants survive. This explains why the species does not grow in northwest Europe with its mild summers, but on the other hand does grow in northeast Europe with its warmer continental summers. Discoveries of the Waterwheel Plant were published in the literature from the 18th and especially from the 19th century on. That time the plant was found in many countries: France, Switzerland, Germany, Poland, Czechoslovakia, Austria, Hungary, Romania, Belarus, Baltic, Ukraine, Russia, Italy, Yugoslavia, and Bulgaria (Caspary 1859). It can be assumed that the influence of human activities on the distribution of Aldrovanda was not substantial before 1940. Today Aldrovanda occurs in Hungary, Italy(? ), Poland, Romania, Switzerland (where it is introduced) and the countries now called Yugoslavia, Ukraine and Russia. The serious decline of the species during this century is most likely caused by the destruction and disturbance of its sites by man (water drainage, pollution by agriculture and industry, and disturbance by recreation). As the plant's ecological requirements are very strict, it is very sensitive and is one of the first plants to disappear. This extreme sensitivity is to be expected for a plant at the edge of its dis­tribution. In western Europe the decline is spectacular and the plant is almost extinct. But it must be stressed that the number of sites there was smaller than those in eastern Europe. The plant still grows in eastern Europe. Here too the disappearance is alarming, but less striking because of the higher number of sites. The expected future agricultural, touristic and industrial development in that part of the continent will not bring much good for Aldrovanda. How does Aldrovanda spread to other places? Most likely this happens via turions or whole plants. In (sub-)tropical areas, seeds might get dispersed too. Three likely dispersal agents are described below. According to Jäger (1964) birds play an important role in the distribution of the plant. A turion, seed, or less likely a whole plant may get stuck to a bird's legs or feathers and thus be carried to another place. Theoretically, a seed could, once eaten, land somewhere else via the excrements of the bird. This is speculative as we do not know whether these minute seeds are eaten and whether the viability is still intact after passing through the intestines of the bird. The occurrence in mountainous regions is most likely a result of introduction by birds. The similarity between the worldwide distribution of Aldrovanda and the routes of some migratory birds is remarkable (Jäger, 1964; Studnička, 1984). So birds might play a role for long distance transport between continents as well as for short distance spread. In regions with interconnected habitats, the plant can be brought to another place by the natural flow in the canals and streams. Habitual floodings in floodplain areas might transport Aldrovanda to isolated pools. It is likely that the plant will disappear from Europe in the future. To prevent it from vanishing, the sites must be protected. Protection alone will not preserve Aldrovanda from extinction, because most disturbance is caused by factors coming from outside the habitats. Despite a number of possible threats, the exact reasons for vanishing are often unknown. (Re-)Introduction might help to maintain the species. To be successful the knowledge of Aldrovanda's ecological requirements must be completed first. Suitable alternative sites are becoming very rare these days. To prevent further genetic impoverishment, there is an urgent need for a gene stock of plants of different origins. Suitable methods for stockage are tissue culture and cryopreservation. Propagation methods (in vitro and in vivo) need to be optimized so that natural populations can be left undisturbed and only propagated specimens should be used for all kinds of experiments. Being ousted by competing species, Aldrovanda has to move regularly to survive. The shorter the travelling distances, the greater the chance of survival. Aldrovanda is able to survive for a long time only in areas with enough suitable habitats close to each other. Aldrovanda has a weak competition ability with surrounding plants. Space, nutrients and light are in limited supply. The only way to withstand elimination is by vigorous growth and propagation. These are promoted by a number of factors, discussed below. As a free floating aquatic, Aldrovanda grows in pools, lakes and river deltas in standing water (Berta, 1961). Typically it is found near the shore, loosely surrounded by other plants (Figure 2). This very productive zone is characterized by rapid succession among different plant populations. So soon Aldrovanda's place will be taken by others and the species will have to migrate to new places. The plant prefers shallow water less than 1 m deep. As the plant is very susceptible to desiccation, a permanent water level is essential throughout the growing season. Most of the time the bottom of the stands is covered with a thick layer of partly decomposed plant remains. In temperate regions the water surface might freeze in winter. The shallower the water, the higher the risk the turions will be killed by the ice. So it may be advantageous for turions to overwinter at places with a considerable water depth (Kamiński 1987b). The water in Aldrovanda stands is mesotrophic and thus medium-rich in nutrients. In oligotrophic waters the plant is always absent. Eutrophication of the water (by intensive agriculture) is thought to be one of the major reasons for the disappearance of the plant. The pH of natural waters ranges between 5.6 and 6.8 (Komiya, 1966; Kamiński, 1987a). The analysis of the water in Polish sites yielded the following results: 0.3-0.6 mg/1 N-NO3, 1.0-1.5 mg/1 N-NH4, about 0.06 mg/1 P-PO4, 2.4-4.0 mg/1 K, less than 40 mg/l Ca, 6.0-15.0 mg/l Mg, 8.0-13.0 mg/l Na, 0.5-1.0 mg/l Fe, 25 mg/l SO42-, 5.0-12.0 mg/l Cl-, and 3-5 mg/l of organic carbon (Kamiński, 1987a). Figure 3: Stand dominated by Phragmites australis and Hydrocharis morsus-range. The largest concentrations of Aldrovanda are found at places like this. It is likely that wind and water currents contribute to the concentration of plants. Europe, 1993. Photo by C. Breckpot. The decomposition of plant material results in the production of organic humic acids. Their concentration in Aldrovanda stands is medium (3-5 mg/l). Waters like these are called dystrophic. Typically, high concentrations of humic acids are found in lakes with a thick layer of plant residues at the bottom. The humic acids are important for Aldrovanda. They are responsible for a much better plant growth during the growing season and they seem to regulate the sinking of the turions (Kamiński 1987b). Carbon dioxide is the carbon source for photosynthesis allowing a plant to grow, Aldrovanda needs relatively high concentrations of CO2 (0.5-2 mM) (Adamec, 1994). One of the main sources of carbon dioxide is the thick organic layer at the lake bottom, where it results from the decomposition of the organic material. So it is advantageous for Aldrovanda to float near this source in shallow water. Phytoplankton, filamentous algae and other aquatic plants can deplete the CO2. During the growing season Aldrovanda needs relatively warm water: at least 16°C (61°F), ideally 23-30°C (74-86°F) (Saito, 1972; Haldi, 1974; Mazrimas, 1978). The water warms up most rapidly at places with low water depth (typically near the shore), dark coloured bottom and full sun. The turions sink to the bottom of the lake in autumn where they overwinter, being protected from the surface frost by the insulating ice above them. Under less favourable conditions the turions fail to sink (Schoenefeld, 1860). Aldrovanda prefers places with high irradiance (Saito, 1972; Haldi, 1974; Hanabusa, 1974). Light is needed for photosynthesis and warms the water. Several factors influence the availability of light to the plant. First of all, the vegetation above the water surface, which should not be too close, too dense or too high, can block light. Floating and submerged plants can intercept light too, so the Waterwheel Plant prefers loose plant communities with nearby open water (see back cover). Another factor is the transparency of the water. Suspended matter, algae and/or phytoplankton can make the water less transparent and thus reduce the amount of light for Aldrovanda. The Waterwheel Plant is very susceptible to overgrowing by filamentous algae (Saito, 1972; Haldi, 1974). Quite a number of other macrophytes can be found near Aldrovanda, indicating its rather large phytosociological range (Figure 3). European populations belong to the floristic unions Nymphaeion, Phragmition and Magnocaricion (Caspary, 1859; Berta, 1961; Kamiński, 1987a). Plants secrete chemical substances which can influence the growth of other plants. The influence can be positive or negative. It has been confirmed experimentally that accompanying plants influence the growth of Aldrovanda in a positive way (Kamiński, 1987b). They seem to produce some vital chemical substances. The nature of these chemicals is still unknown. Some important stimulating neighbours are: Typha latifolia, Stratiotes aloides, Phragmites australis, Carex spp., and Hydrocharis morsus-ranae. Aldrovanda only appreciates the company of other plants as long as the vegetation remains open. In Europe, Utricularia vulgaris or the related U. australis are often found in the neighbourhood of Aldrovanda. Although the two genera regularly occur together, Utricularia is much less rare than Aldrovanda. One might expect prey is useful for every carnivorous plant, but from cultivation experience it appears that a number of carnivorous plants can live perfectly without it. In the case of Aldrovanda, prey plays an important role (Kamiński, 1987b). Zooplankton populations are always considerable in communities with the plant. Probably zooplankton is a source of substances which Aldrovanda cannot take up from water in sufficient amount. Standing waters are preferred as here there is little chance that the traps may be closed unnecessarily by movements in the water. A number of populations have disappeared by the draining of lakes. 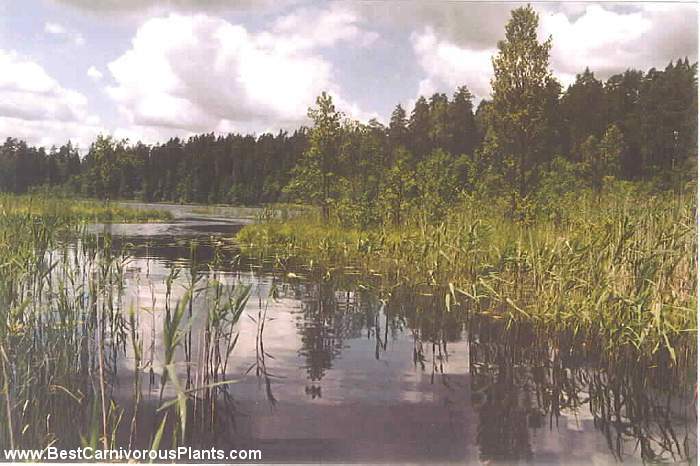 Some habitats still exist but for unclear reasons the plant has disappeared there too-most likely changes in the water quality are responsible. The water chemistry can be influenced by precipitation and by runoff. Changes of water content do not necessarily influence Aldrovanda directly. They might speed the decomposition processes in the bottom sediment. As a result the nutrient levels in the water rise (Bloemendaal & Roelofs, 1988). This situation might be beneficial for competitor plants (macrophytes and algae) resulting in dense plant communities with reduced light availability and CO2 depletion. For weak competitors like Aldrovanda, one or a combination of the results of eutrophication might become fatal in time. It is unclear at what growth stage Aldrovanda is most susceptible. Probably the sprouting of the turion is the most critical point. Changes in the structure and chemistry of the bottom sediments (increased concentrations of toxic substances like sulfides and ammonia) and reduction of the transparency of the water might inhibit the germination process as suggested in studies of the decline of Stratiotes aloides (Bloemendaal & Roelofs, 1988). In temperate zones, the reproduction of Aldrovanda only takes place vegetatively. This means that all specimens of a stand are more or less genetically identical. So all individuals are equally susceptible and react similarly to changed conditions. When conditions become less favourable, the lack of genetic diversity is a disadvantage and can lead to a rapid disappearance of the population (Weeda et al.,1991). On the other hand, when the conditions are right Aldrovanda might form extensive populations in a short time (Ohtaki & Katagiri, 1974). The cultivation of the Waterwheel Plant is often said to be (extremely) difficult. Although it is not the most ideal plant to start a carnivorous plant collection with, most problems can be overcome by good planning, regular follow up and sufficient knowledge of the plant's needs. To be successful, Aldrovanda's ecological requirements need to be respected strictly (Ohtaki & Katagiri 1974). The creation of a suitable aquatic habitat is not as easy as mixing two parts peat to one part sand! Water chemistry is complicated and a lot of factors interact with each other. If you start to create the biotope after you obtained Aldrovanda, you are probably acting too late and are likely to lose the plant. Therefore, the habitat needs to be prepared months in advance. As soon as the water conditions have become suitable and stable, the Waterwheel Plant can be introduced safely. The best place to grow Aldrovanda is outdoors in an earthenware or plastic container. I grow my plants in a round plastic lily pond 1 metre in diameter and 35 cm deep. It is important to use a relatively shallow container with a large surface area. The smaller the volume of your container, the more difficult it will be to create and maintain stable conditions. The tank can be protected from curious birds with a net. There are a few records of cultivation indoors (Ashida, 1934; Ohtaki & Katagiri, 1974), but I doubt that the plant can be grown that way for prolonged periods. Aldrovanda prefers places with abundant light (Saito, 1972; Haldi, 1974; Hanabusa, 1974; Ohtaki & Katagiri, 1974). Light is needed for photosynthesis and warms the water, which the Waterwheel Plant definitely appreciates. It is still unclear whether full or half-sun is best (Kamiński, 1987b). Too much direct light might cause an explosive growth of algae. Figure 4: Aldrovanda in cultivation. Accompanying plants are Carex sp., Menyanthes trifoliata, Phragmites australis and Thelypteris palustris. Photo by C. Breckpot. The water temperature during the growing season must be at least 16°C (61°F) with 32°C (90°F) as a maximum, but ideal temperatures are 23-30°C (73-86°F) (Saito, 1972). The lower the water temperature, the slower the growth, and the carnivorous activity of Aldrovanda will be reduced. Prolonged water temperatures of 29-31°C (84-88°F) cause the Waterwheel Plant to flower (Saito, 1972). Prevent overheating by shading; in overheated water algae might become a serious problem. In colder regions the water temperature can be kept high by protecting the container from the wind by insulating or burying it and by covering it with glass. Aldrovanda prefers clean, yellowish brown, peaty water with low concentrations of nitrogen and phosphorus. Rainwater is fine, if it is not too spoiled. Alternatively one can use deionized or peat-infused tap water (Mazrimas, 1974). A water depth of 20-30 cm is sufficient. To prevent accumulation of nutrients, it is recommended that part of the water be replaced regularly. The carbonate hardness should be kept medium high to high (test kits are available in garden centres and aquarium shops) as it helps to minimise acidity (pH) fluctuations and stimulates the decomposition of organic substances. Carbon dioxide (CO2) is a key element for photosynthesis. Shortage of it inevitably leads to meagre growth and eventually death. Aldrovanda prefers waters with a high CO2 concentration. Most carbon dioxide in water is produced by bacteria which are responsible for the decay of organic substances. Therefore, the more comfortable we make life for them, the more valuable gas they will produce. While CO2 continuously diffuses into the atmosphere and is consumed by terrestrial plants, there should be a steady production to maintain the appropriate concentration. There are several methods to raise CO2 levels artificially (Wilson, 1995). What are the basic needs of bacterial life? They need oxygen and food in the form of organic material. The main sources of oxygen in water are diffusion from the atmosphere and production by water plants. So it is advisable to grow enough submerged plants in the pond to maintain the oxygen level. Artificial aeration should be applied with care as it not only raises the oxygen level but also lowers the CO2 concentration. A thick layer of sand on the bottom of the container forms a stable anchoring base for the accompanying rooted plants. Beneath this a small layer of peat can be useful too. Above the sand comes a layer of half decomposed (not fresh!) leaves of sedges, Iris, reeds, arrowheads or rice grasses a few centimetres thick (Saito, 1972; Haldi, 1974; Hanabusa, 1974; Mazrimas, 1974; Ohtaki & Katagiri, 1974). The plant remains will help to maintain a low pH, keep filamentous algae under control and act as a carbon dioxide and humic acid source. The decomposition of this material gives the water a yellowish brown colour. After some time the layer will become exhausted and must be replaced with new material. The water must be slightly acidic with a pH between 5.6 and 6.8 (Saito, 1972; Haldi, 1974; Ohtaki & Katagiri, 1974; Mazrimas, 1978). Check the pH regularly. If the water is alkaline, then you have to lower the pH by replacing part of the water and adding new plant remains. Aldrovanda should not be grown without other plants (Figure 6). 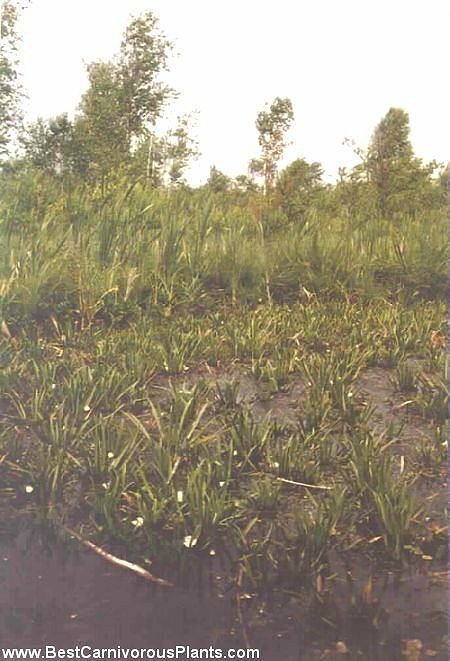 The company of other water and marsh plants helps to lower the nutrient levels in the water by direct uptake and by stimulation of the decomposition process. Moreover it has been confirmed experimentally that neighbouring plants influence the growth of Aldrovanda in a positive way (Kamiński, 1987b). Sedges, Iris, reeds, arrowheads and rice grasses are good companions (Hanabusa, 1974; Ohtaki & Katagiri, 1974). All small water crustaceans are suitable as prey: Branchiopoda (e.g. Daphnia spp. ), Copepoda (e.g. Cyclops spp. ), Ostracoda, etc. Look for a healthy, algae-free mesotrophic pond nearby (hard to find in my neighbourhood!) and fish out a quantity of microfauna. 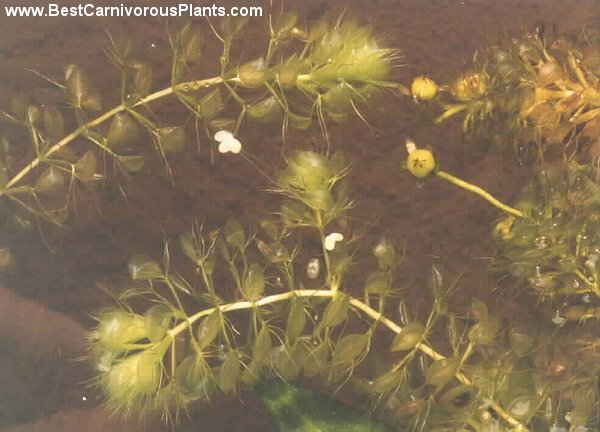 Introduce these organisms into the Aldrovanda tank and if the water conditions are right, they will survive and reproduce. Another important role of the microorganisms is to help prevent excessive development of floating algae. Good indicators of the plant's health are the thickness of its apex (thick, onion-shaped-good; thin-bad), the length of the adult plant (more than 1 cm-good) and the number of branches (few-good; none-bad) (Saito, 1972; Mazrimas, 1978). Healthy water should be clear, straw coloured, contain a variety of small living microorganisms and be as free from algae as possible. Algae may endanger your Aldrovanda. Weak plants become easily infected and will not survive. If the above mentioned requirements are met, your plants will grow fast enough to withstand algae quite well but this does not mean that nothing should be done about it! Too much algae is an indication of bad water conditions. Of all algae, filamentous algae are probably the worst to beat. Take away as much algae as you can, change one or more water parameters and pray. Addition of chemicals (alum, copper sulphate) only solve the problem temporarily and are not appreciated by the Waterwheel Plant. Water snails can be useful to minimize filamentous algae (Ohtaki & Katagiri, 1974) but some species feed on higher plants like Aldrovanda, so be careful. The best way to propagate Aldrovanda is by stem cuttings a few centimetres in length (Mazrimas, 1978; Slack, 1986). Healthy plants do this work for you by forming numerous offshoots. Prepare winter buds for prolonged frost periods by insulating the container. Alternatively you can store the turions in the refrigerator at 3-5°C (37-41°F) in cultivation water or in a box filled with live Sphagnum. Check your water and plants regularly, they need a lot of attention! Never add fertilisers (nitrogen/phosphorus/potassium) to the water. Last but not least, do not give up too fast, finding the right water balance is time-consuming. Good growing! I dedicate this article to L. Adamec and R. Kamiński who have been most helpful. Thanks also to all others who provided material and valuable information. The Carnivorous Plant Newsletter editors kindly refined the manuscript. Adamec, L. 1994, private communication. Ashida, J. 1934, Studies on the leaf movement of Aldrovanda vesiculosa L. I. Process and mechanism of the movement, Mem. Coll. Sci. Univ. Kyoto, Ser. B 9, 141-244. Ashida, J. 1935, Studies on the leaf movement of Aldrovanda vesiculosa L. II. Effect of mechanical, electrical, thermal, osmotic and chemical influences, Mem. Coll. Sci. Univ. Kyoto, Ser. B 11, 55-113. Aston, H.I. 1983, Aldrovanda vesiculosa L., in Flora of Australia, vol. 8, 64-66. Berta, J. 1961, Beitrag zur Ökologie and Verbreitung von Aldrovanda vesiculosa L., Biológia (Bratislava) 16, 561-573. Bloemendaal, F.H.J.L., & Roelofs, J.G.M. 1988, Waterplanten en waterkwaliteit, K.N.N.V, Utrecht. Caspary, R. 1859, Sur l'Aldrovanda vesiculosa, Bot. Ztg. 17( 13-16), 117-150, and two plates. Caspary, R. 1862, Sur l'Aldrovanda vesiculosa, Bot. Ztg. 20(24-26), 185-206, and one plate. Darwin, C. 1896, Insectivorous Plants, D. Appleton and Company, New York. Degreef, J.D, 1997, Fossil Aldrovanda, Carnivorous Plant Newsletter, 26:93-97. Diels, L. 1906, Droseraceae, in Das Pflanzenreich, 26 (IV, 112), 1-136, Leipzig. Duval-Jouve, 1861, Bull. Soc. Bot. France 8:518-519. Fenner, C.A. 1904, Beiträge zur Kenntnis der Anatomie, Entwickelungsgeschichte and Biologie des Laubblätter and Drüsen einiger Insektivoren, Flora 93, 335­434, and plates VI-XXI. Haberlandt, G. 1906, Sinnesorgane im Pflanzenreich. V. Insectivoren: Aldrovanda vesiculosa. Leipzig. Haldi, J. 1974, Culture of Aldrovanda vesiculosa, Carnivorous Plant Newsletter, 3:28. Hanabusa, K. 1974, Growing Aldrovanda, Carnivorous Plant Newsletter, 3:28. Huber, H. 1961, Aldrovanda, in Hegi, Illustrierte Flora von Mitteleuropa, ed 2. IV(2a), 18-20. Carl Hanser Verlag, München. Iijima, T. 1981, Action Potential in the Trap-lobes of Aldrovanda vesiculosa, Plant and Cell Physiol. 22(8), 1595-1601. Jäger, E. 1964, Zur Deutung des Arealbildes von Wolffia arrhiza (L.) Wimm and einiger anderer ornithochorer Wasserpflanzen, Ber. Deutsch. Bot. Ges. 77, 101­-111. Kamiński, R. 1987a, Studies on the ecology of Aldrovanda vesiculosa L. I. Ecological differentiation of A. vesiculosa population under the influence of chemical fac­tors in the habitat, Ekol. Polska 35, 559-590. Kamiński, R. 1987b, Studies on the ecology of Aldrovanda vesiculosa L. II. Organic substances, physical and biotic factors and the growth and development of A. vesiculosa, Ekol. Polska 35, 591-609. Knobloch, E., & Mai, D.H. 1991, Evolution of Middle and Upper Cretaceous Floras in Central and Western Europe, Jb. Geol. B.-A. 134(2), 257-270. Komiya, S. 1966, A report on the natural habitat of Aldrovanda vesiculosa found in Hanyu City, Amatores Herb. (Kobe, Japan), 27, 5-13. Lloyd, F.E. 1942, The Carnivorous Plants, Waltham, Mass. Mazrimas, J.A. 1974, Further hints on growing Aldrovanda, Carnivorous Plant Newsletter, 3:27-28. Mazrimas, J.A. 1978, Aldrovanda, Carnivorous Plant Newsletter, 7:102-103. Ohtaki & Katagiri 1974, How to grow Aldrovanda, Carnivorous Plant Newsletter, 3:10-11. Reichenbach, G.H.L. 1839, Reichenb. Icon. FI. Germ. et Helv, III. t.XXIV, Figure 4521. Saito, T. 1972, Growing Aldrovanda vesiculosa, Carnivorous Plant Newsletter, 1:61-­62. Schoenefeld, W. 1860, Sur le mode de vegetation de Aldrovanda vesiculosa en hiver et au printemps, Bull. Soc. Bot. Fr. 7, 389-392. Sibaoka, T. 1991, Rapid Plant Movements Triggered by Action Potentials, Bot. Mag. Tokyo, 104(1073), 73-96. Slack, A. 1986, Insect-Eating Plants and How To Grow Them, Alphabooks Dorset. Studnička, M. 1984, The carnivorous plant Aldrovanda vesiculosa, In Czech, Zhiva (Prague) 32, 173-176. Takahashi, H. & Sohma, K. 1982, Pollen Morphology of the Droseraceae and its Related Taxa, Sci.Rep.Tohoku Univ.4.ser.Biol. 38, 81-156. Weeda, E. J. 1991, Nederlandse oecologische flora, Wilde planten en hun relaties 4, I.V.N., Amsterdam. Wilson, D. 1995, Waterwheel plant Aldrovanda vesiculosa in the Northern Territory, Bull. Aus. Carniv. Pl. Soc. 14: 11-13. "Used with joint permission of the International Carnivorous Plant Society"